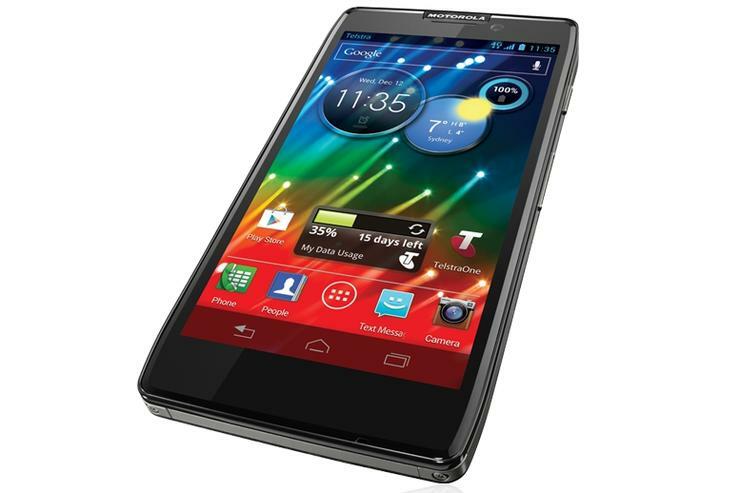 The Motorola RAZR HD, available today through Telstra, has a 2500mAh battery. Motorola has revamped the user interface of its latest Android smartphones because users find Google's mobile operating system "fairly complex", the company revealed today. Speaking at the launch of its new RAZR HD and RAZR M 4G smartphones in Sydney today, Motorola Mobility's managing director for Australia, New Zealand and the Pacific Islands, Timo Brouwer, said the company has listened to feedback from consumers in an attempt to make the software on its phones "much simpler" to use. "We've really focussed on simplifying the user interface," said Brouwer. "A lot of feedback we get is users find Android fairly complex, so we've put a lot of effort into changing that." "The home screen delivers 95 per cent of the things people look for out of the box," he explained. "Turn the phone on, 95 per cent of the things that you're looking to use will be there on the home screen. We've spent a lot of time trying to get that right." The two new Motorola phones — the RAZR HD and the RAZR M — will exclusively be sold in Australia through Telstra and both are 4G devices that work on the 1800MHz LTE network. Motorola Mobility's managing director for Australia, New Zealand and the Pacific Islands, Timo Brouwer, unveils the RAZR HD. Motorola says the RAZR HD and the RAZR M are the first phones to come from the Google-Motorola partnership since Google agreed to acquire the company for $12.5 billion back in August 2011. "We are now focussing on doing fewer things better," said Brouwer. "We're making some big bets around the world and these two phones are the first two phones out of this Google-Motorola partnership and they represent two of those big bets. We think the combination of Google and Motorola will start to change the way people use their mobile devices." The Motorola RAZR HD and the RAZR M have similar internal specifications, but slightly differ in design and screen size. 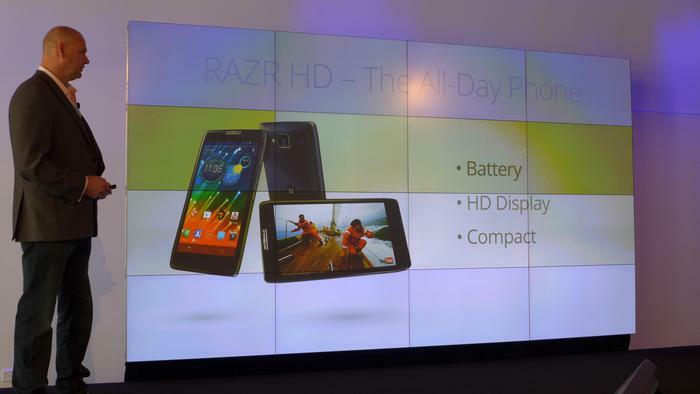 The RAZR HD has a large 4.7in screen with a 720p HD resolution of 1280x720, while the smaller RAZR M has a 4.3in screen. Motorola says it pushed the screen as close as possible to the edge of the phones in order to maximise the screen without compromising on physical size. Motorola focussed heavily on improving the battery life of both phones. The RAZR HD has a 2500mAh battery, while the RAZR M has a 2100mAh battery. "When you start using 4G, big screens and a lot of content, battery life really becomes a significant issue," explained Brouwer. "If you're plugged into a wall your phone isn't mobile. So we've gone to a significant design effort to make sure that that isn't an issue." "We've focussed on incorporating much bigger batteries without compromising the size of the device. [The RAZR HD] has a powerful 2500mAh battery which has 20 per cent more than the Samsung Galaxy S III, 40 per cent more than the HTC One X and double the talk time battery life of the iPhone 5, so it's a significant improvement in battery life." Both the RAZR HD and the smaller RAZR M feature a gorilla glass screen, a Kevlar fibre backing and a splash-guard coating that makes the phones "water-repellent". In addition to the outside of the handsets, Motorola has also coated the internal components with the splash-guard material. The Motorola RAZR HD and the RAZR M are both powered by a 1.5GHz dual-core processor, have 1GB of RAM, feature a microSD card slot for memory expansion and have an 8-megapixel rear camera. Both models will initially ship with Android 4.0 Ice Cream Sandwich software, but Motorola has promised the RAZR HD will be updated to the latest 4.1 Jelly Bean version "before the end of the year." The RAZR M Jelly Bean update will follow in "early 2012". 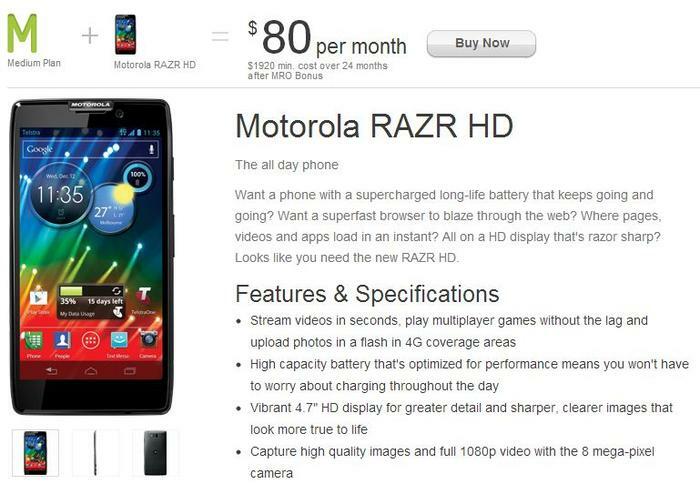 The Motorola RAZR HD shown on Telstra's Web site. The Motorola RAZR HD is available today through Telstra stores and online for $720 outright or $5 per month on Telstra's $60 Everyday Connect plan over 24 months. Telstra says the Motorola RAZR M will launch sometime in November for $600 outright, or $0 per month on a $60 Everyday Connect plan over 24 months. Do you find Android hard to use? Is battery life a big consideration for you? Let us know your thoughts in the comments below.